Harris-Thompson, Danyele & A. Malek, David & L. Wiggins, Sterling & Klein, Gary. (2017). Low Fidelity, High Impact: Using Decision Making Exercises to Build Expertise in the Process Control Industry. .
Harris-Thompson, Danyele & A Malek, David & L Wiggins, Sterling. (2017). Shortening the Expertise Curve: Identifying and Developing Cognitive Skills in Board Operators. .
Polakonda, Raghavendra & Ganapathy, Subhashini. (2014). Mobile Computing for Field Operator Control: Petrochemical Plant Operations Case Study. IIE Transactions on Occupational Ergonomics and Human Factors. 2. . 10.1080/21577323.2014.1000468. Underwood, Steven & Shinkle, Jennifer & Gallimore, Jennie. (2010). Operator Display Issues: Examples from Hydrocracking. 246-254. 10.1201/EBK1439835036-28. Lau, Nathan & Powers, David. (2016). System-Task Analytical Framework for Monitor Assessment. 184-189. 10.1109/RWEEK.2016.7573330. Smallman, Harvey & Cook, Maia. (2013). Proactive Supervisory Decision Support from Trend-Based Monitoring of Autonomous and Automated Systems: A Tale of Two Domains. 8022. 320-329. 10.1007/978-3-642-39420-1_34. Cook, Maia & Smallman, Harvey & Rieth, Cory. (2014). Increasing the Effective Span of Control: Advanced Graphics for Proactive, Trend-Based Monitoring. IIE Transactions on Occupational Ergonomics and Human Factors. 2. 00-00. 10.1080/21577323.2014.905885. Borders, Joseph & Polander, Noel & Klein, Gary & Wright, Corinne. (2015). ShadowBox™: Flexible Training to Impart the Expert Mindset. Procedia Manufacturing. 3. 1574-1579. 10.1016/j.promfg.2015.07.444. Klein, Gary & Borders, Joseph. (2016). The ShadowBox Approach to Cognitive Skills Training: An Empirical Evaluation. Journal of Cognitive Engineering and Decision Making. . 10.1177/1555343416636515. Wang, Ray & F. Edgar, Thomas & Baldea, Michael & Nixon, Mark & Wojsznis, Willy & Dunia, Ricardo. (2017). A geometric method for batch data visualization, process monitoring and fault detection. Journal of Process Control. . 10.1016/j.jprocont.2017.05.011. Wang, Ray & F. Edgar, Thomas & Baldea, Michael & Nixon, Mark & Wojsznis, Willy & Dunia, Ricardo. (2014). 387285 Multivariate Control Charts in Radial Coordinates. . He, Jingwen & Purao, Sandeep & Becker, Jonathan & Strobhar, David. (2011). Service Extraction from Operator Procedures in Process Industries. 335-349. 10.1007/978-3-642-20633-7_24. H. Ikuma, Laura & Harvey, Craig & F. Taylor, Claire & Handal, Cristina. (2014). A guide for assessing control room operator performance using speed and accuracy, perceived workload, situation awareness, and eye tracking. Journal of Loss Prevention in the Process Industries. 32. . 10.1016/j.jlp.2014.11.001. Koffskey, Christina & H. Ikuma, Laura & Harvey, Craig & Aghazadeh, Fereydoun. (2014). Using Eye-Tracking to Investigate Strategy and Performance of Expert and Novice Control Room Operators. Proceedings of the Human Factors and Ergonomics Society Annual Meeting. 58. 1667-1671. 10.1177/1541931214581348. H. Ikuma, Laura & Koffskey, Christina & Harvey, Craig. (2015). A Human Factors–Based Assessment Framework for Evaluating Performance in Control Room Interface Design. IIE Transactions on Occupational Ergonomics and Human Factors. 2. 00-00. 10.1080/21577323.2014.990589. Koffskey, Christina & H. Ikuma, Laura & Harvey, Craig. (2013). Performance Metrics for Evaluating Petro-chemical Control Room Displays. Proceedings of the Human Factors and Ergonomics Society Annual Meeting. 57. 1717-1721. 10.1177/1541931213571383. Harvey, Craig & Uhack, Glen & Bégat, Vanessa. (2015). Empirically evaluating and developing alarm rate standards for liquid pipeline control room operators. Cognition, Technology & Work. 17. . 10.1007/s10111-015-0326-2. The Center for Operator Performance funds research conducted by academic institutions and private companies. Our general approach is to conduct a small pilot effort in a particular area prior to funding larger investigations. Information - This research informs the membership on the nature of an issue or topic. This is often a prelude to a more detailed study. Benchmark – A benchmark project establishes limits of human performance or industry practices by which member companies can judge their performance and need for change. If significant change is needed, it may require the development of a method/tool. Method/Tool – This research will produce a method or product that can be used by member companies to improve performance. Recommended Practice – This is a set of actions, guidelines, or a methodology that has been shown through COP research to improve operator performance. Our objective to produce high performance operators has lead to the focus on 11 key factors which shape performance and impact operations. As illustrated in the graphic, we have defined the topics by four areas: Interface, System, Operator, and Culture. Although each key factor is distinct, the research topics are not independent of nor isolated from each other. By organizing ourselves with this easy-to-understand outline, we have streamlined our process and continue to produce research projects that directly benefit the process control industry and informs the decision-making of our members. As technology and automation have increased in the process industries, more is produced with fewer operators. As these changes have occurred, the role and requirements of the process operator have also changed. For the first 100 years of the oil industry, operators were largely male, high school graduates who handled all aspects of the unit (or portion of unit) for which they were responsible. With the advent of distributed control systems, this began to change. Control of the units was being separated from the outside functions while the diversity of the workforce increased. Eventually control became concentrated in a single building, instead of scattered around local control centers. The operators in these buildings no longer monitored a process controlled by single loop feedback control, but oversaw a process wherein an advanced process control system manipulated numerous variables simultaneously. As the demands of an ever-increasing span of control made management of process upsets more difficult, safety instrument systems were installed to automatically shutdown the process should it wander into regions of unsafe operation. The importance of the human factor in this sort of technological shift has been seen in other industries. The aerospace industry found in the 1940-50s that human performance capability was the limiting factor in aircraft performance. The 1960-70s revealed, through the accident at Three Mile Island, that humans could be the weak link in operation of nuclear generating facilities. Explosions at Phillips Chemicals’ Pasadena Complex in 1998 and BP’s Texas City Refinery in 2005 revealed that the same issues that plagued the aerospace and nuclear power industry were present in oil and chemical processing. 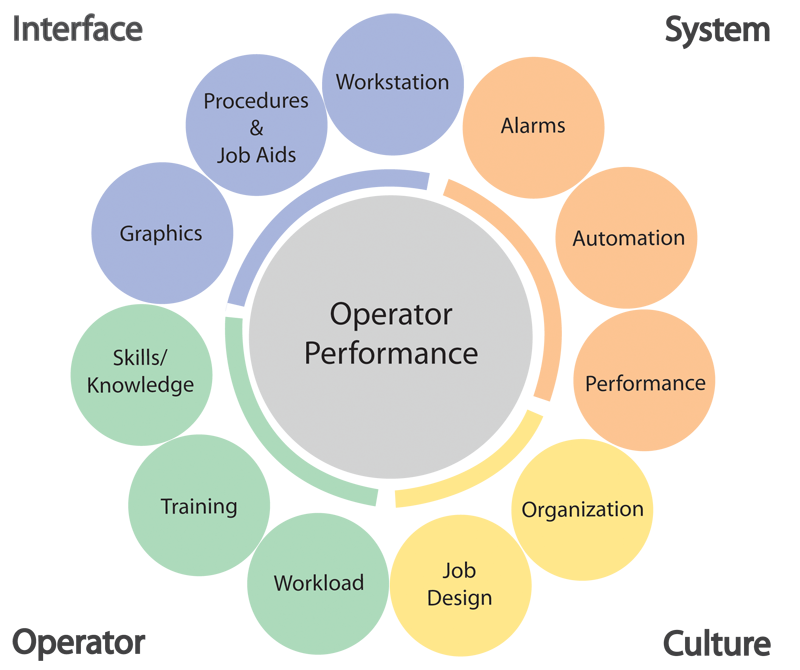 The Center for Operator Performance was conceived to help address these issues.